Catherine Mannheim was born in South Africa where her father was a well-known photographer. A family friend who was a jeweller let her spend time in his workshop and this later inspired her to study jewelry. She studied at the Central School of Art and in Germany under Friedrich Becker. Returning to London she set up her first workshop and began teaching. She has been making jewellery for more than 40 years and during these years it has evolved from figurative to more organic and soft forms. But she has always been interested in the texture of her materials and she loves the way that she can form and manipulate gold. Subtle texture and reflections of soft luminous gold and carefully selected stones are her palette. The use of richly colored gems juxtaposed with subtle matt golds in simple forms are her idea of an elegant and timeless piece of jewelry. Every piece, mainly ring, necklace or earrings, is made by hand using ancient techniques. Her inspiration comes from the art of old cultures but also from using gold and transforming it. Her jewelry is in the collections of the Victoria & Albert Museum London, the Goldsmiths Hall, The Crafts Council and West Midlands Jewellery Collection. 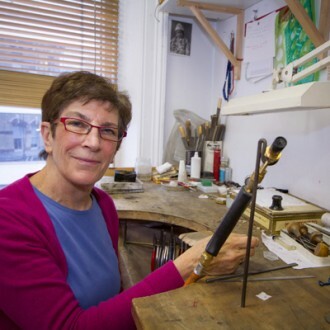 Catherine Mannheim has been made a Freeman of the Goldsmiths Hall and the City of London, both a great honour.